Pete Kolakowski has signed for the Lions. 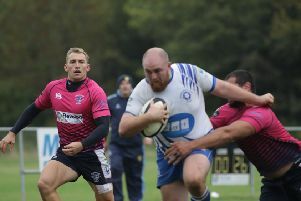 Peterborough Lions are in great shape and raring to roar into action against Derby at Bretton Park on Saturday (3pm). The Lions will be playing their third season in National League Division Three and will again be fancied to be among the frontrunners. In their first season in the National League they finished third, narrowly missing out on the promotion play-offs, and last season they attained a top-four finish, which was not a bad effort seeing as they suffered an early-season injury crisis. So can they improve, secure promotion and move up a level? That’s a question head coach Darren Fox, now going into his third season at the helm, won’t be drawn on. “My aim is to get the best out of the players, make sure they improve and make sure we’re competitive at this level. I don’t do bold predicitions,” he said. “The results will look after themselves. But if we are there or thereabouts at Christmas then we’ll be going for it. The Lions were away on tour over the Bank Holiday weekend in Cornwall and played Camborne on Saturday in their last pre-season friendly. “They play at the same level as us - in the South West division - and it was an ideal test,” said Fox. “They were a big physical side and it was just what we needed going into the Derby game. “We lost 19-12, but we were much the better side in the second half. They kicked a few penalties to get the win. Fox, a former Northampton Saints and Bedford Blues star, came on himself for the last 20 minutes to score one of the Lions’ tries (Joe Andresen got the other) but Fox is only likely to play next season if required. On the signing front, experienced forwards Josh Waller (ex-England Under 18s) and Peter Kolakowski (ex-British Police) have joined the Lions on a permanent basis from National League One Cambridge after playing for them on loan last season. Fly-half Nico Defeo has also joined from Cambridge and he’s represented Italy at Under 21 level. Talented back row player Tom Gulland is another ex-England Under 18s man moving to Bretton Park. He was with National League One club Blaydon last season and before that Newcastle Falcons Academy. New centre Jonathan Hill (33) hasn’t played for a couple of seasons but has a very impressive pedigree, having played for Cardiff Blues (20 games in the 2005/2006 season), Wasps Academy and Ulster. He was outstanding in the game against Camborne. For the Derby fixture, the Lions are without Sam Crooks, Curtis Weaver (both unavailable), Del Le Ray Veenendaal and Matt Dunn (both injured). Derby were promoted via the play-offs from Midlands Division One last season. Lions squad v Derby: B. Howerd, E. Makas, J. Waller, L. Stapleton, J. Lewis, P. Kolakowski, M. Andrijauskas, T. Lewis, C. Humphrey, T. Gulland, T. Dougherty, T. Aviss, N. Defeo, W. Carrington, B. Taylor, J. Hill, G. Offer, K. Henderson, R. Morris, V. Horne, J. Andresen.